In 2018 our school district invited parents and leaders throughout the community to stand together in front of all its schools to greet students with signs displaying positive messages of hope, support, and reassurance for our children. Following the unfortunate events that took place at Stoneman Douglas HIgh School in Parkland, Florida, widespread fear and uncertainty took place at schools across the country as a surge of threat claims, mostly originating from internet and social media platforms, we investigated and largely proven to be unsubstantiated rumors. Nevertheless, the consequences of the sensationalized subject matter produced legitimate fear among youth and their families, sparking protests and walkout at schools across the country. While students participated in staged walk-outs throughout the country, Patterson students were instead welcomed-in to their schools by parents and community leaders holding signs with messages of love, positivity, and reassurance that they are cared for and sage within our community. 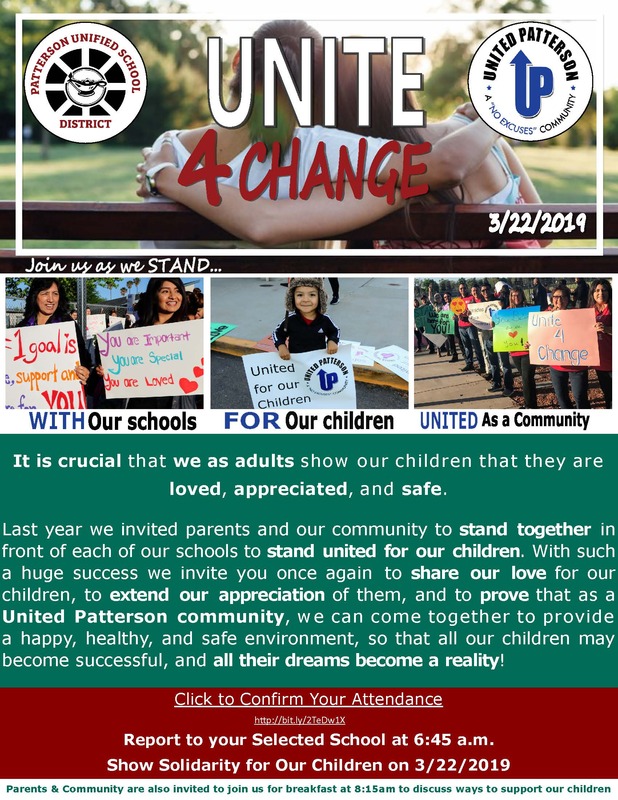 With such a wonderful turnout in the first year event, our district hopes that Unite 4 Change becomes a annual tradition where parents, staff, and adult leaders are reminded that our students education and well-being remains the number one priority in our community, and that we are here for them to ensure their welfare and success.